The Rajshahi Kings side have booked their berth in the final in their maiden entry to the BPL T20. Surviving the eliminator against the Chittagong Vikings, the Kings beat the Khulna Titans tonight in the second qualifier by 7 wickets which places them in the tournament decider against the Dhaka Dynamites on Friday, 9th December. Keeping KHT to a chaseable 125, RK got past the finish line with 4 balls remaining. In pursuit of the total, the Kings lost Mominul early, albeit Nurul and Afif set the tone cautiously. 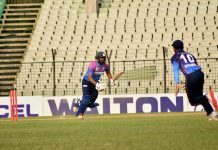 Nurul walking back for 14, Afif played a deliberate innings of 27-ball 26 before getting trapped in front by Mahmudullah. Sabbir, after a while, flourished with his bat, accompanied by James franklin, to drive Kings rest of the way toward final in 19.2 overs. Sabbir was not out on 43 and Franklin on 30. For Titans, Mahmudullah, Cooper and Mosharraf claimed one wicket each. Khulna started it in a mess as they lost both of their openers for run out within 3 balls. Shuvagata Hom gifted his wicket from the following over of Farhad Reza reducing his side to 17/3. Mahmudullah and Pooran attempted a repair with their 20-ball 37 run stand before Pooran (22 off 10 with 2 fours and as many sixes) was caught at long-on by Farhad Reza charging Afif down the wicket for a big shot. Samit Patel then claimed 3 titans including Mahmudullah (22) from his back-to-back overs lessening KHT to 87/7. Williams and Sammy joined the wicket hunt party before Ariful Haque lifted the team to a modest total of 125 with his unbeaten 32.